Guile was a colonel in the U.S. Special forces. His best friend since basic training was a skilled fighter named Charlie. The two had great respect for one another, and were often sent on missions together. In 1987, the two were assigned to lead a unit into Cambodia to investigate an organization called Shadowlaw. During the dangerous mission, the entire unit was captured by Shadowlaw forces. M.Bison, the leader of Shadowlaw, tested an experimental drug called DOLL on Guile's unit. The drug was a "psycho- drug" which brought out a user's agressive tendancies. The drug caused all the members of Guile's unit to kill each other; Charlie and Guile were the only survivors. After months of inprisonment, he and Charlie managed to escape, but on the long trek back to civilization the two were seperated. Guile eventually made it back to his base, where he found out that Charlie had arrived first and had been sent to track Bison down. Guile became worried about his friend when Charlie did not come back for several months. After almost a year passed, Guile was sent to Cambodia to bring Charlie back. When Guile arrived, he found that the Shadowlaw base had been abandoned. After some investigation, Guile discovered that the organization had been moved to Brazil. Guile left Cambodia for Brazil in the hopes that Charlie would be there too. When he arrived at Brazil, he discovered that that base had been abandoned as well, and quite recently by the looks of it. In his search for clues, he found Charlie's bloody dogtags at the top of a waterfall, and after searching for his friend for hours assumed he was dead. Guile swore that he would avenge Charlie's death by tracking down Bison. Knowing that the military would not allow him to undertake a revenge mission, he stopped checking in with them and continued his search for Bison alone. After several months, Guile finally learned that Bison had moved his operation back to Southeast Asia. When he arrived in Thailand at the new Shadowlaw base, he found a surprise: Charlie was alive and well. He was a part of a large Interpol force that had gathered to destroy Bison's newly built Psycho Drive. Guile, relieved to see his friend alive again, was not about to let Charlie undertake such a dangerous mission, and the two almost came to blows. Suddenly, Guile understood what this mission meant to Charlie and decided to go along with it. The combined forces stormed the base and made their way to the Psycho Drive chamber. Guile and Charlie set explosives in the chamber, and the group was about to leave when they were attacked by Shadowlaw forces led by Bison himself. Having just been recharged with Psycho Power, Bison overpowered the intruders. Guile watched in horror as Charlie was fatally wounded by Bison. Charlie got up and attacked Bison again, and ordered Guile to move the troops out. Unwilling to leave his dying friend, Guile had to be dragged out of the base by the fleeing Interpol troops. The base exploded, and this time Guile knew that his friend was really gone. Seeing Bison escaping the blazing compound, Guile renewed his vendetta and swore this time to see Bison dead. Guile returned to his base in order to gain the military's support, but found that he was considered a loose cannon and had been discharged. Completely consumed by rage, Guile left behind his wife and daughter and set out on a new quest for vengeance. After some time, Guile learned of the second World Warriors tournament that was being held in Thailand. The tournament was being held by Bison himself, and Guile immediately registered for the tournament in the hopes of facing and killing Bison. The tournament attracted numerous warriors, and Guile found himself opposing many skilled warriors. Wearing Charlie's dogtags to remind him of his mission, he breezed through his opponents until he faced a Russian wrestler named Zangief. 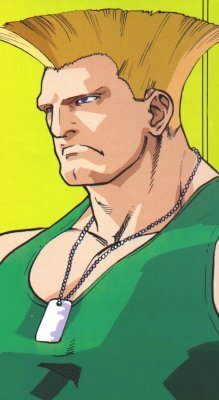 It seemed that during the numerous competitions Guile had entered in order to find Bison, he had earned a reputation. Zangief had been sent by his government to prove that the American Guile was not championship material. Zangief almost proved that contention, as Guile was barely able to beat him. Although he emerged victorious, Guile was exhausted and wounded from the fight and was no match for his next opponent, Sagat. Guile nearly escaped with his life and decided to wait until after the tournament to finally take his revenge. Before the tournament was over, Guile discovered that his wife Jane had followed him to Thailand. Ever since he had left, she had been trying to find him and was only able to do so when he entered the World Warriors tournament. Guile was happy to see her, but his mind was still on revenge. Only when he realized that the young woman standing with his wife was his daughter Amy did he understand how foolish his vendetta had been. When he and Charlie had left on the mission to Cambodia all those years ago, Amy was just a child. He had only seen her once since then, and had missed her entire childhood. Amy begged her father to return home with them, and Guile could do nothing but agree. After a time, he learned to accept what happened and finally put the memories of the past to rest.